In the Heart of County Down. 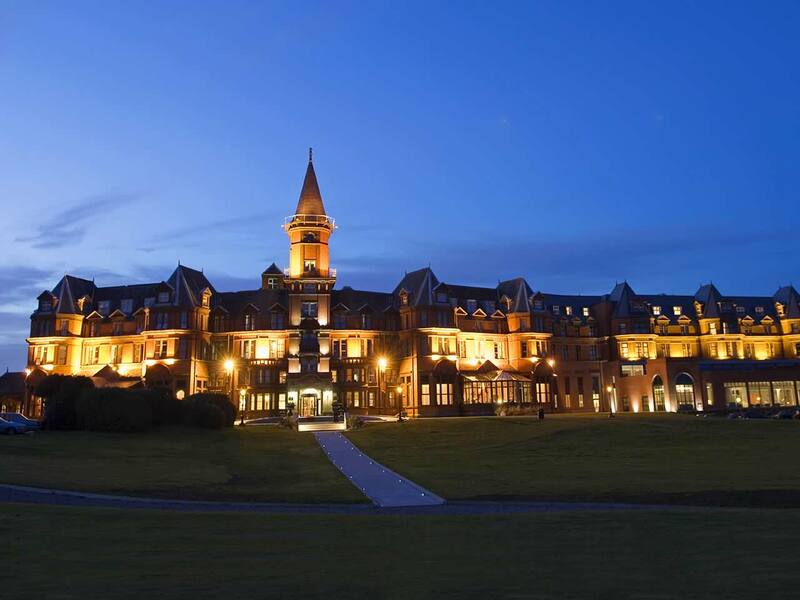 The Slieve Donard Hotel is in the heart of County Down and is home to The Hastings Hotel Group. This 4 star Hotel & Spa is breathtaking. Think Downton Abbey meets the seaside in N.Ireland. With the most magnificent views across landscaped grounds views of pure natural beauty including the spectacular Mourne Mountains and Irish Sea coastline. The Slieve Donard Hotel can be found off the main heart of the Newcastle town. With its winding driveway, you are instantly greeted with grandure. The 4 star Slieve Donard Resort and Spa in County Down offers 181 comfortable and stylish bedrooms, including Classic Rooms, Superior Rooms, Executive Rooms, Resort Rooms and 6 luxury Suites. This Hotel makes it the perfect wedding location with that private city escape without having the leave the country, and is able to offer you and your wedding guests a warm and inviting stay. You can even visit their amazing spa perfect for relaxing. 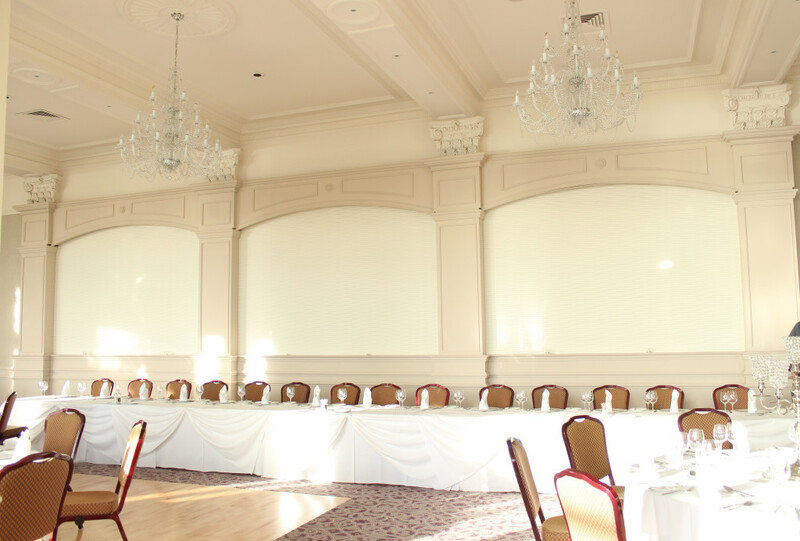 With 2 main function rooms which include The Ballroom and the Chandelier Room, each room has something to offer. When I first met the Bride to be Leah at our showroom in Lurgan she had told me they were to get married in mid December and that their wedding reception would be in The Slieve Donard and if we could provide them with a fairy light backdrop, that would add a backdrop for their top table of fairy light warm white lights. Fairylight backdrops, light curtains, or wedding backdrops add that extra something to your wedding decor. They can be used to hide unsightly pictures, walls or to simply add its own beauty to the room. It makes the perfect wedding photo backdrop for all those important wedding speeches. Photographed below is a photo of the stunning Chandelier Room in the Slieve Donard which has recently been refurbished. 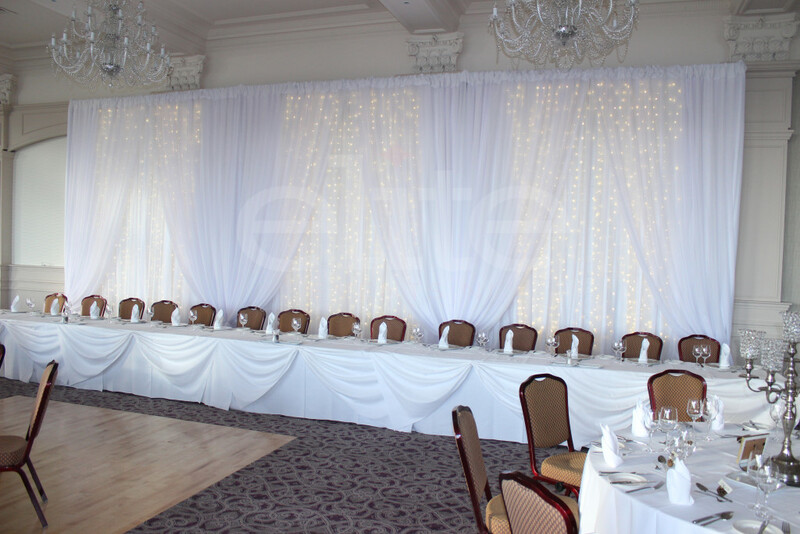 We decided to take a before and after photo to show how a fairy light backdrop can transfer the feel of the room. The Bride and her Bridesmaids got to see the backdrop first and they were delighted how beautiful it was. December isn’t the most common of wedding seasons but has become increasly popular. Whether your hoping for snow or a dry crisp day. There is always an added excitement. When you enter your reception room you know that the natural daylight may have just come to an end and the fairy lights will glisten, creating the right atmosphere to the room. If you would like to find out how to hire us for your wedding or event, please email to info@eliteeventsni.com. We offer a wide range of products including chiavari chairs, chair covers, led light up letters, candy carts, table overlays and table runners, centrepieces, table skirts, table cloths and lots more. You can also book in for an appointment in our showroom in Cido Business Complex in Lurgan.